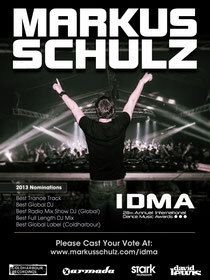 The shortlist for the 2013 IDMAs were recently announced and DJ, producer, broadcaster and label head Markus Schulz has picked up nominations in five of the Awards’ categories. Celebrating its first decade on air, Markus’ weekly Global DJ Broadcast show is back in contention for Best Radio Mix Show and he’s also been shortlisted for the Best Global DJ gong. Continuing with the IDMAs, Dutch record company Armada Music received 18 nominations for this year’s Awards. As previously mentioned, the four-times winner of the ‘Best Global Record Label’ award is once again in the running of prolonging their title. 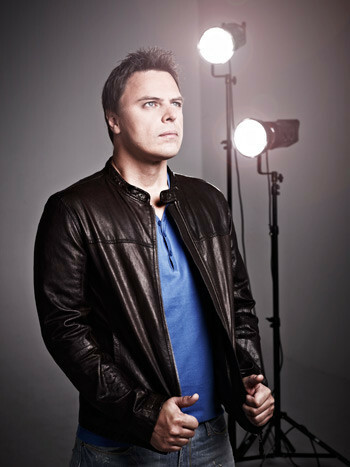 Maykel Piron, CEO and co-founder of Armada Music, is nominated for ‘Best Record Label Executive’ after receiving the awards in 2010, 2011 and 2012. Armin van Buuren, one of the co-founders of the label, received 10 nominations in nine different categories. The winners of the 2012 WMC’s International Dance Music Awards will be announced during this year’s Winter Music Conference, which takes place in Miami between the 15th and 24thof March.